I hope everyone is having a wonderful (i)National Scrapbook Day. There are lots of fun sales and events on the web today. Lots of ways to get into trouble - and I like that! Today I want to share with you a gift tag I made using (mostly) dies from Papertrey Ink. I have been a follower of PTI since the beginning of their site. When I started buying from them, they had 3 stamp sets. 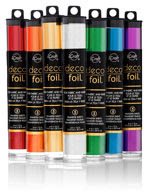 In the years since, they have added more designers, more product lines, exclusive papers and now dies. If I thought I couldn't love them more, well...the dies threw me over the edge. 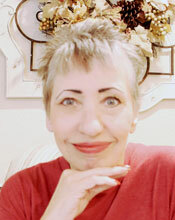 The owner of the site is Nichole Heady. She is a talented designer and a marvelous business woman. I admire her work and her determination to sell only the highest quality items. I hope you will become as big a fan of PTI as I have. 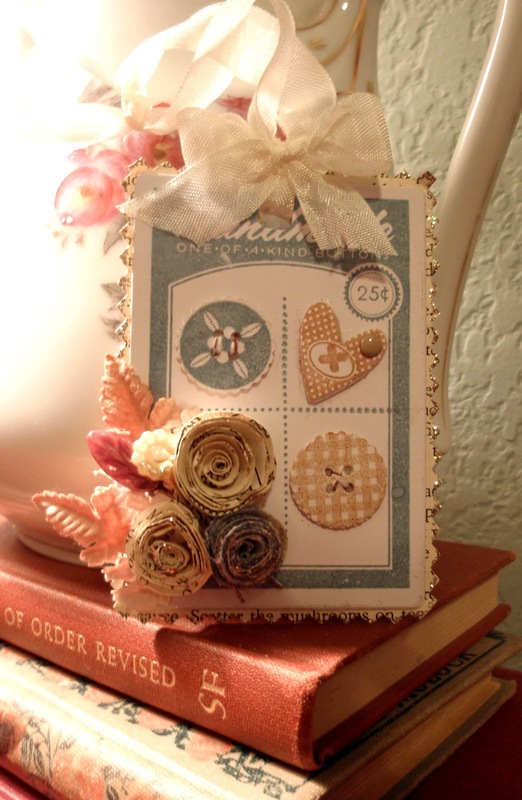 Here is a picture of the stamp set I used to create my gift tag - it is called Button Boutique. If this set were not perfect enough, there are coordinating dies to go with it. The button card and the buttons have dies. You have to check them out on the site. I die cut the buttons from card stock and also chipboard. I stamped them with a background stamp and then tied baker's twine through them. The little heart tag is also from PTI. It is a die called tiny tags - and it has 10 tiny tags on ONE die. It is awesome. I cut it out from card stock and also chipboard. The tiny tags die has a coordinating stamp set. 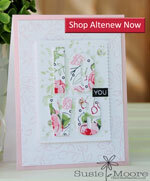 All in all - between the buttons and tags - both stamp sets and die sets are perfection. 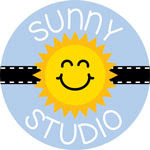 The other die I used on this tag was from MFT Stamps and it is the rolled flower die. I made all three flowers from this one die. I used book pages for two of them and self adhesive fabric for the third. To finish up the tag, I backed the tag with book paper and then used pinking shears to edge it. I backed that with chipboard and then cut one more button card out of self adhesive fabric so that both sides are finished and lovely. I used platinum Stickles around the pinked edges and also lightly over the flowers. I added some leaves and 2 stick pins and a ribbon tie. This tag is ready now to adorn a gift I'll be giving in the near future. Be sure to check out Papertrey Ink. 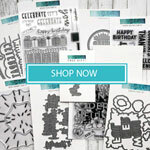 You'll love their innovative stamps and dies. I promise. This card is so sweet love the colors and the flowers..have this set too..I am a huge fan of PTI and their goodies!